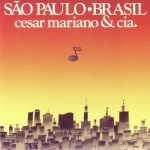 Review: Over the years, Cesar Mariano and Cia's 1977 set "Sao Paolo Brasil" has achieved cult status, with dusty-fingered diggers regularly proclaiming it one of the finest jazz-funk/fusion albums of the period (a fact confirmed by the high prices that original vinyl copies often change hands for online). Remarkably, this timely Mr Bongo reissue marks the first time the set has been released outside of its native South America. Rich in glistening jazz guitars, fizzing, Azymuth-style organ riffs, spacey synths, warm bass and skittish drums, the album's eight tracks bristle with breeziness, subtle samba motifs, sumptuous dancefloor grooves, sunny downtempo workouts and effervescent arrangements. In a word: essential.